Our gallery of baby nursery pictures are worth their weight in gold to parents in the process of decorating the baby’s room. Written project tutorials are helpful, but there is just so much that the written word can convey; pictures are truly worth 1,000 words or more when it comes to decorating. I find that I get some of my very best painting ideas for bedrooms from picture galleries so for those of you venturing into the world of decorating a baby nursery, we have decided to gather as many pics as we can in not just one photo gallery but several galleries organized according to style of décor and baby gender. We have our baby nursery photos organized in the following galleries including a baby girl nursery photo gallery, a baby boy photo gallery as well as examples of neutral nurseries and pictures of nurseries for twins. Our goal is to help modern parents share their photos so that others can get decorative inspiration from their finished product. Whenever possible, we encourage our amateur decorators to share their resources for baby bedding and furniture, nursery wall paint colors and instructions for their wall painting techniques as well as entering their nursery room pictures in our baby photo contests. Who could help but admire the photos featuring stunning, hand painted wall murals and of beautifully decorated bedrooms filled with luxury nursery furniture and crystal mini-chandeliers as well as pics of rustic rooms with handcrafted baby furniture that had been in the family for generations with homemade quilts and rag rugs. 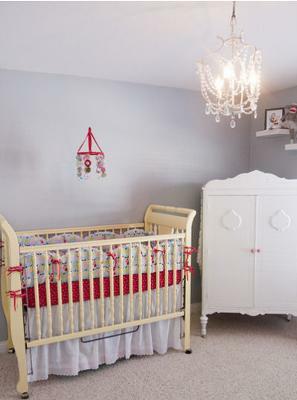 All of the rooms in the baby nursery pictures were arranged in such a tasteful and loving manner that it would take your breath away to think how beautiful it would be to wake to such lovely decor each day. The amazing nursery wall murals in the photos that were painted according to each of the baby nursery themes make you want to throw caution to the winds and tackle the difficult task of drawing designs large enough to cover the entire nursery wall. 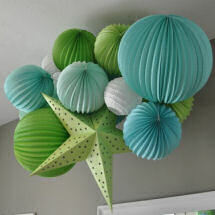 There are baby nursery pictures of decorated nurseries in popular baby room themes with instructions for easy geometric, argyle, polka dot, striped and abstract nursery wall painting techniques that a beginner can easily manage for the cost of a cheap bucket of paint. 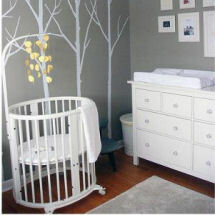 If you look at many of our baby nursery pictures, the wall painting techniques are what makes the room POP! The way the decorators choose their baby's color schemes are just as compelling as the nursery wall decorating ideas, so take a moment to kick back and enjoy these beautifully decorated nurseries that will literally knock your socks off and make you green with envy! After your portfolio has been filled with photos of beautifully decorated nurseries , please stop by and upload your own nursery pictures to inspire moms and dads searching for unique and creative nursery designs.